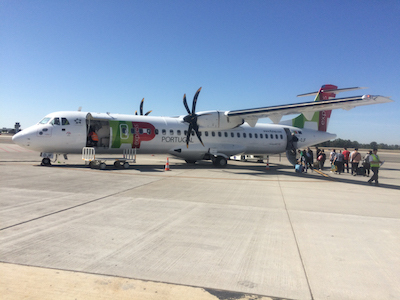 TAP Portugal flight from Seville, Spain to Lisbon, Portugal was not the international flight I was expecting. (read my about my first class experience here). The twin propeller plane offered only two classes; passengers and crew. The 50 minutes flight just gave enough time for crew to pour everyone a 2/3 full cup of soft drink (not enough time to either pour or consume the remaining 1/3) and collect the empty cups. On arrival in Lisbon I learned why marijuana is considered a gateway drug. Having alighted from the airport bus into Rossio Square, my gateway into the city, I had not even fully extended the handle on my suitcase when I was offered a bud or two of grass (with a free try if I wanted). My saying “no” was not a refusal but merely a gateway to immediately being offered cocaine or ice. I either look like a soft touristy target or an experienced user of hard drugs. Portuguese police should simply dress as tourists to find all of the dealers, during a 15 minutes walk along a shopping mall I was approached at least ten times. 1. Not all roads included on the map actually exist. 4. The roads included on the map are more general in their shape, direction and length than the actual roads. Stylised maps are more artists impressions of the city than a map. It they were printed on boxes of breakfast cereal they would include the disclaimer “suggestion only”. Perfect time to hire a vehicle and drive on the right-hand side of the road. I drove to Belem, a coastal region brimming with 25 historic sites and museums. 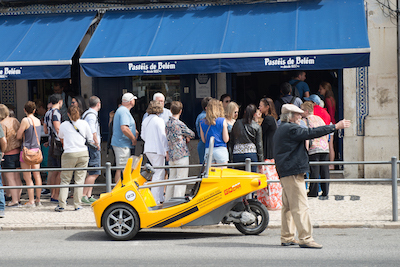 The highlight was fresh Portuguese custard tarts straight from the oven at Pastéis de Belém. They are always straight from the oven (in their hundreds) because they are so good there is usually a line down the street. My vehicle of choice for this journey was a GoCar. The is a vehicle that is half car, half motorbike and Nana’s gopher/scooter and comes complete with its own GPS directions and commentary. It was a silly as it was scary. That said the driving was largely uneventful except for two separate and unrelated incidents. I did manage to drive over my own foot and did need to be rescued in the end. I was also pick-pocketed at some point on this driving /pastry adventure. Thanks to my fool proof security measures all that Fagan acquired was about €1.40 in change and a sachet of icing sugar left over from the custard tarts. 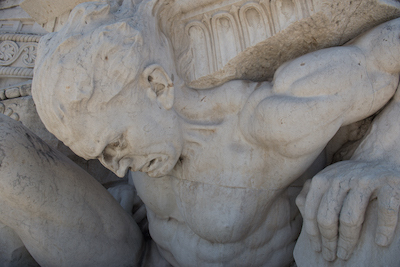 Lisbon suffered a major earthquake in 1755, arguably one of the most destructive earthquakes ever. 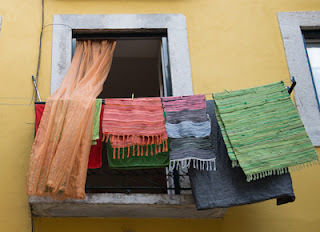 According to all of the local museums and historic sites Lisbon’s history can be divided into two parts, before the quake and after the quake. Now my Portuguese is not great so something may have been lost in translation however, according to all of the museums and commentaries, it appears that everything before the quake was in some way responsible for the quake and every event after is as a direct result of the quake. · The 1910 revolution leading to Portugal first becoming a republic – caused by the quake. · The brutal Salazar dictatorship from 1933 to it being overthrown in 1974 – both directly caused by the quake. · The embarrassment of scoring no points in the 1997 Eurovision Song Contest – caused by and as disastrous as the quake. The earthquake was so devastating that all of the Portuguese people including the royal family had to assist in rebuilding the city. That said, King Jóse I contributed by building himself a few adjoined huts, lining their interiors with velvet and refusing to leave until his death some 15months later. Castelo de Sao Jorge is on top of a hill…Lisbon is a city of seven hills so to be fair everything is at the top of a hill. Stepping inside is like entering a scene from Game of Thrones. GoT producers do find the castles of the wider region quite Moorish. Perhaps why the reason they keep attacking cities and taking over the castles is really about the profits from the obligatory gift shops. 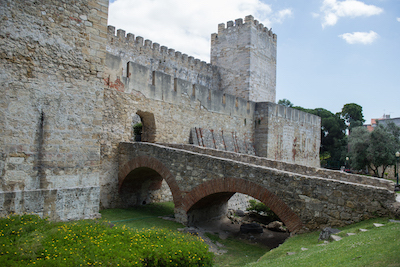 Like many castles and palaces in the region Sao Jorge is built on the grounds of a former Islamic site. Out of all of the daily household items created, what is it about water vessels that make the main if not only remnants to be discovered in archaeological digs. Lisbonites throughout history, starting with the Moors, like a good tile. Lisbonians have not limited their use to the bathroom or even the interior of a building. Many Lisbonese building exteriors are also covered in decorative tiles. Less decorative, but the Lisbonish footpaths are also paved with small tiles. Maybe National Tiles’ own Alan Walker is a Lisbian. 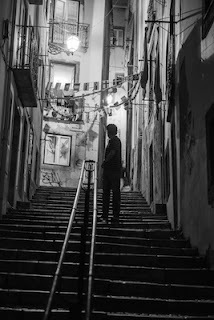 During my stay Lisbon was celebrating its annual festival Festas de Lisboa. One of Portugal’s national dishes is salted cod. Another is sardines. During the festival one restaurant was boating its special Festas dish, grilled sardines served with cabbage soup. This city knows how to party! Lisbon is also very fond of pastries. There are a lot of pastry shops and bakeries. Freak family tradition is to frequent bakeries freakuently whilst on holidays and who am I to break such a tradition. Also, I wish to show that I am culturally sensitive so visit a bakery at least once a day.